Finding that just-right volume level is the job of the volume control buttons that cling to the left side of the Samsung Galaxy Tab. When you press the top part of the volume button, it makes the volume louder; pressing the bottom part makes the volume softer. As you press the volume button, a graphic appears on the touchscreen to illustrate the relative volume level. You can touch the Settings button to see more detailed volume controls. You can individually set the volume for media, alerts, and alarms, as shown in the expanded onscreen volume control: Drag the green dot left or right to set the volume. No mouse necessary. Just use your finger. When the volume is set all the way down, the Tab is silenced. 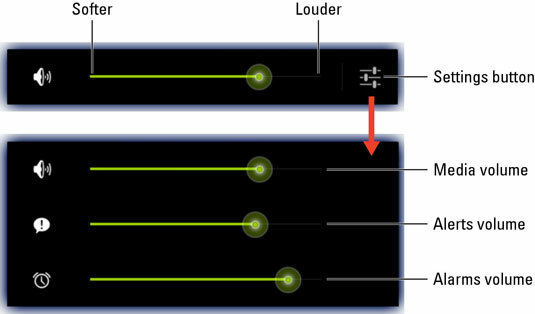 Silencing the Tab by sliding down the volume level places it into Vibration mode. The Volume button works even when the Tab is snoozing (in Sleep mode or when the touchscreen display is off). That means you don’t need to wake the Tab if you’re playing music and need to adjust the volume.